The August 2016 report covers main issues as determined by the CoM that could affect residents and ratepayers, or could be a matter of public interest. Download the report from here. This report also includes the results from the 2016 Hawkesbury City Council Elections. The September meeting of the NRDCAA will be held on Monday 19th September at the North Richmond Community Centre, William Street, North Richmond commencing at 7:15pm. The AGM will be held on 21 November, 2016. All positions will be declared vacant. Colleen Turnbull will not be standing as Secretary/Public Officer. Please consider nominating, computer skills required. Bells Line of Road and Grose Vale Road, North Richmond (Stage 2). Richmond intersection improvements – Stage 2 Bells Line of Road and Grose Vale Road, North Richmond report can be downloaded here. Comments and responses from consultation for proposed work at the intersection of Bells Line of Road and Grose Vale Road can be downloaded here. A separate Community Consultation Report has been published for the proposed improvements at March Street and Bosworth Street intersection – also part of Stage 2. Greetings !! It’s that time again !! Monday 15th August , 7:15pm at North Richmond Community Centre, William Street, North Richmond your community group will meet again. There has been lots happening so come along and be informed. Don’t forget HCC elections are coming on September 10th included in that is a referendum on splitting the council electorate into 3 wards- come along Monday night and be informed about why it is NOT a good idea for the Hawkesbury. Tea, coffee, biscuits and of course good company assured. And don’t forget the raffle!! Invite and encourage your neighbours ,family and friends to attend. Together we can make a difference, so don’t just sit at home and whinge get involved. The July 2016 report covers main issues as determined by the CoM that could affect residents and ratepayers, or could be a matter of public interest. Download the report from here. 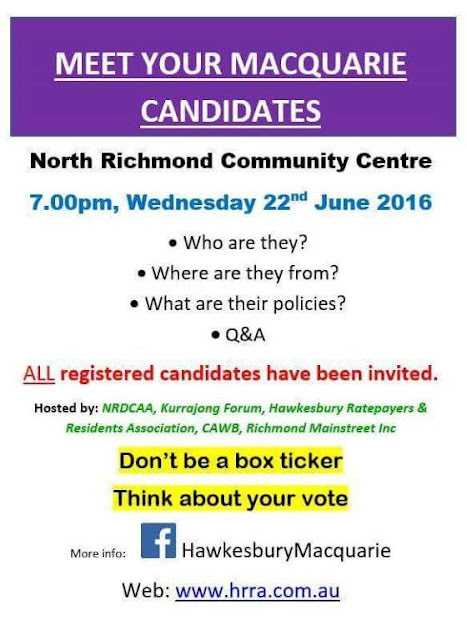 Don't forget our Community Election for the seat of Macquarie on Wednesday 22 June, 2016 at 7pm also at North Richmond Community Centre. Redbank at North Richmond (Belmont Precinct) Torrens title subdivision to create 59 residential lots, two open space lots and one residue lot, 96 and 322 Grose Vale Road, North Richmond. To register to speak at the meeting, please contact the Regional Panels Secretarial before 4pm on Tuesday 1 March, 2016 on 02 9228 2060 or email suzie.jattan@planning.gov.au. As the regional panel will have read all the submissions and documentation before the panel meeting, you should focus your oral submission on the assessment report and its recommendation rather than re-stating the information in your written submission. Please find the Council report for February, 2016 meeting, download here.